For its first event, Kwantlen Polytechnic University’s newest student group, the KPU Anime Club, joined a crowd of anime fans from other post-secondary institutions. 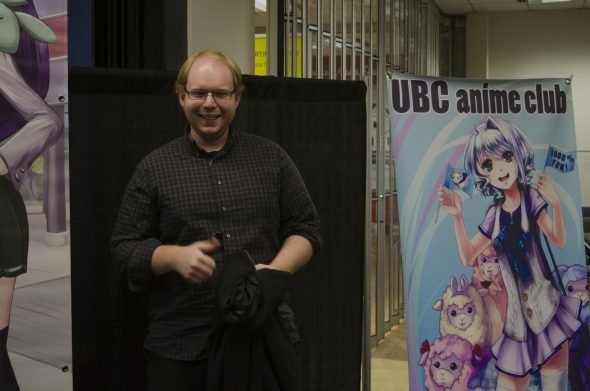 The club was founded in November by Murdoch de Mooy, Kwantlen Student Association Faculty of Arts Representative, after he was contacted by a UBC librarian who asked if KPU had an anime club of its own. Up until that point, the university had never had a club dedicated to watching and discussing Japanese animation. De Mooy saw this as the perfect opportunity to explore his love of anime with like-minded students at KPU. He says that he found signatories and sent away the paperwork almost immediately. “We became an anime club within two or three days,” says de Mooy. This wasn’t his first experience with leading a club. De Mooy has previously been involved in the Kwantlen Gaming Guild as an executive member and event organizer, and he says that the experience he gained there helped him create the new anime club. Shortly after it was founded, the KPU Anime Club was invited to join a potluck with the UBC, SFU, BCIT, Langara, and Capilano University anime clubs. The event took place on Nov. 18 in the Great Hall on BCIT’s Burnaby campus. Attendees brought food, video games, card games, and different kinds of anime-related merchandise. There was also karaoke that started at 7:00 p.m., which drew out an enthusiastic crowd of singers and audience members. Like most other people at the event, Ho’s love for anime started in his youth, and he’s happy that the KPU Anime Club has given him an opportunity to meet other fans of the genre. Matthew Clemente, another member of the anime club and a friend of Ho’s, says that he joined for the same reasons. Club members are hoping to organize more collaborations with other universities in the future, as well as movie nights and panel discussions about anime and manga. He hints that even though he may need to leave the group in the future, he’s confident that the other members will be able to continue to run the Anime Club and facilitate events for future KPU students.